Located just moments from Regent Street and Regent's Park, this striking 2 bedroom, first floor apartment offers exquisite contemporary interiors and a fantastic Balcony. Weymouth Street is a prestigious residential road adjacent to the shops and restaurants of Great Portland Street and is within good distance of Oxford Street and the surrounding areas. 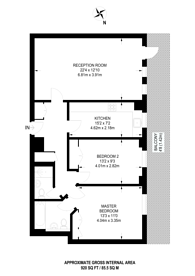 920 (85 Sq M) approx.